Ever since iPhone firmware 1.1.3 users could add Safari bookmarks to their home screen. 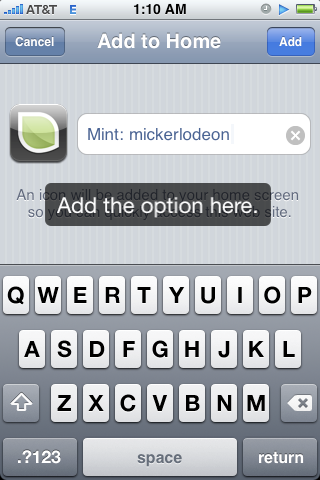 This allowed web developers to create custom icons to be used whenever a user would add it to their own iPhone’s home screen. And, since firmware 2.1 developers could set a meta tag on their web pages forcing those web pages to open up in Safari without the browser chrome (address bar/search bar and bottom toolbar) when opened from the home screen. To make matters worse, I have only seen one web page that actually includes the meta tag in it. The web page is used for Transmission’s (a bitTorrent clients) browser based remote feature. But, maybe you don’t want it to open as a full screen page, you don’t have that option. I would like to be able to have Google Reader open up in a full screen browser, but I can’t. Currently I don’t even have a Google Reader icon on my home screen, in fact I don’t have any web pages saved as home screen icons, and there is a simple reason why. The reason is that if Safari currently has a a web page loaded that isn’t the same URL as the home screen bookmark, Safari will open that web page in another browser window, even if the URL is on the same domain, meaning that when I leave Safari if it had Google Reader’s starred items page open, when I try to open Google Reader from the home screen it will load it in a new browser window. Clearly this isn’t the most elegant solution to this problem. Letting the user choose what home screen bookmarks open as full screen pages would solve all of these problems. Users might actually use the feature and web site developers wouldn’t have to weigh the pros and cons of adding the meta tag to their pages, they could have it both ways. Hopefully Apple will eventually address this problem, but for now I guess we’ll just settle for Push Notifications (which is obviously unrelated, but cool none the less). Update 4/1/09: After initially writing the post I did find a bookmarklet (bookmarklet and instructions can be found here) that would allow you to force any web page to open in full screen. But, this still isn’t the optimal solution, Apple really needs to bake this into an upcoming release. Expecting users to seek out a bookmarklet is just silly, and adding the feature probably wouldn’t take that much effort anyway.